Congratulations to the Texas A&M University Imperial Barrel Award (IBA) team for winning third place in the Gulf Coast Section of the IBA Competition! The Texas A&M University IBA team won third place at the 2017 Gulf Coast Regional Imperial Barrel Award Competition sponsored by the Gulf Coast Association of Geological Societies and the American Association of Petroleum Geologists (AAPG). The students competed March 17, 2017 against 10 other universities from Alabama, Louisiana, Mississippi, and Texas. The competition was held at the Anadarko headquarters in The Woodlands, Texas where the team presented a detailed petroleum systems analysis of the offshore Northern Carnarvon Basin in Northwest Australia. This year’s IBA team included geology master’s students Cristina Figueroa, Vicky Gao, and Telemachos Manos, geophysics master student April Rider, and geology doctoral degree student James Teoh. This is the first IBA team in the department’s history to have a majority female team, with 3 of the 5 team members being female. The team’s faculty advisor was Dr. Juan Carlos Laya, an assistant professor in the Department of Geology and Geophysics. The team was mentored by two alumni petroleum geologists, Vernon Moore (Marathon Oil) and Tim Powell (independent). 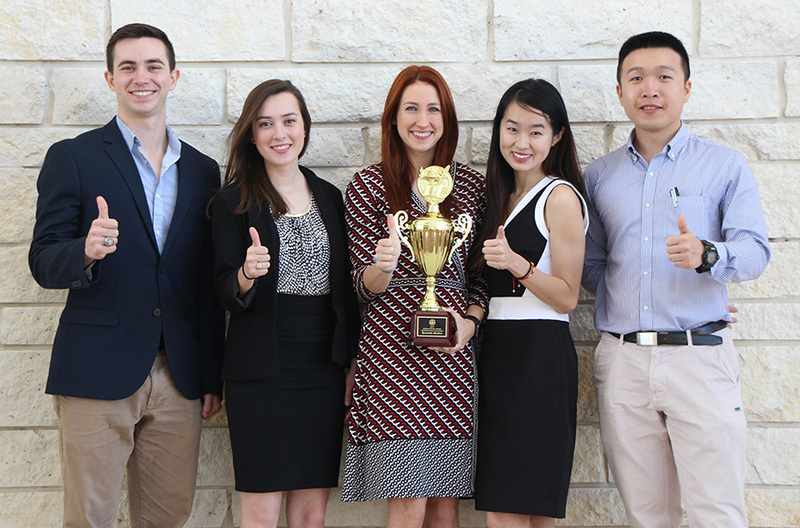 Congratulations to the 2017 Texas A&M University IBA team for bringing home a third place trophy and $250 check! For more information about the IBA program, click here. The 2017 Texas A&M University IBA team with third place trophy. From left to right: Telemachos Manos, Cristina Figueroa, April Rider, Vicky Gao, and James Teoh.